Leigh Curyer, CEO and Director of NexGen Energy talked about the demand for nuclear power with the Investing News Network at the PDAC in Toronto. Leigh Curyer, CEO and director of NexGen Energy (TSX:NXE,NYSEAMERICAN:NXE), talked about demand for nuclear power with the Investing News Network at the Prospectors & Developers Association of Canada (PDAC) convention in Toronto earlier this week. Curyer said demand for nuclear energy is growing by 1 to 2 percent per year, with large reactor builds happening in China, the Middle East, India and Japan. He said production cuts from the major producers including Cameco (TSX:CCO, NYSE:CCJ) will put upward pressure on uranium prices, which he expects to rise this year with increasing momentum in 2019 and 2020. NexGen is one of the companies to receive an award at PDAC, the Bill Dennis award for its Arrow deposit in Saskatchewan’s Athabasca Basin. The Bill Dennis award is named after a former PDAC president, and honors an individual or team of explorationists that made either a significant discovery or an important contribution to the exploration industry. NexGen completed a preliminary economic assessment (PEA) in 2017 and has continued drilling since then. The company is doing geotechnical and metallurgical work that will form the basis of a prefeasibility study; it is expected to be released in late Q3 or early Q4 of 2018. Curyer also applauded the Saskatchewan government for its support and partnership, which were the reasons NexGen chose to develop a uranium deposit there and not elsewhere in the world. “We made a decision, we’re going to be investing people’s money in a jurisdiction; we can’t be side swiped by political unrest or unfair regulations. That’s why we chose Saskatchewan,” he explained. The transcript for this interview can be found below. Click here to view our PDAC 2018 playlist. INN: There’s a lot of excitement I hear this year. 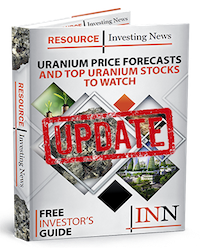 LC: There are some big things that have happened in our industry recently, which suggests that there’s a tightening of supply, and that can only be good for upward pressure on uranium prices. INN: And when you say there have been some things that have been happening, you mean the production cuts from the major producers, right? LC: That’s exactly right. So Cameco have put McArthur River on care and maintenance. Now, that was the world’s best mine, one of the lowest-cost mines and one of the highest-producing mines globally. It would indicate that the cost of production has got to a point where they need high realized prices on the contracting side. There’s been a lot of publicity about it, and with respect to nuclear fuel, the security of supply is very, very important. Whenever there’s been a major disruption in the supply side, uranium prices have normally responded very healthily because it’s a very tight market. And so, after a long period of depressed uranium prices, it looks as though things are about to change. INN: Any idea when that might be? LC: Well, it’s commonly thought by most market analysts that we’ll start seeing some movement this calendar year and then the problem, well the situation will start to really exacerbate in 2019 and 2020, where they expect to see prices to really be considerably higher than where they are today. But the exact week, I’ve been wrong before. But I think since NexGen was incorporated in 2011, I don’t think there’s been a more — I haven’t been more confident going into a calendar year with respect to not only a project, but also the fundamentals for uranium and higher prices. INN: Can you talk about some of the demand there is for nuclear energy? LC: Yes. Demand is growing steadily at 1 to 2 percent per annum. Very large reactor builds out in China, the Middle East. India just announced that they’re building 12 new reactors. And amazingly, a lot of people would be unaware of this, but Japan who currently has five reactors operating, they’re going to have another four by the end of May this year. So in a couple months’ time, they’re going to have increased their nuclear capacity by 80 percent. They’re also building three new reactors in Japan as well. So the demand for nuclear energy is very, very strong. And if you look at 2006 year, as advised, nuclear energy made up 18 percent of all energy sources. Coal and gas around sixty-five. Renewables was about 3 percent at that time. Go forward a decade to 2016, nuclear energy was at 18 percent. So exactly the same as what it was a decade ago. Renewables have increased, but it’s cut into the coal and gas energy supply. So nuclear has proven throughout a period of time with its ups and downs that it maintains basically a real steady growth of about 1 to 2 percent per annum. But over a decade it has maintained its percentage as an energy mix within the overall energy supply. So it’s very strong on the demand side, but it’s a supply-side driven consequence at the moment with tightening supply of mines. And the mines, there are some major ones that the world’s relied on over many years. They’re coming to an end of their useful life. McArthur, which has been really exceptional, does have a long mine life, but its cost of production relative to the actual contracting price has gotten into a bit of a squeeze. Tim Gitzel, the head of Cameco, has been very open about that. INN: Right. And so here at the conference, NexGen is up for an award. It’s the Bill Dennis award for the discovery of the Arrow deposit. What was your reaction when you found that out? LC: Look, it was incredibly pleasing to receive such a prestigious award. It is a reflection of a lot of people’s effort. Our shareholders, our directors, our employees, both current and past employees, explorationists who’d been in the area prior to us. The geology department of the Saskatchewan government who had done regional surveys over the years. It’s really an award that reflects a lot of contributions throughout the industry and within our company. And it’s a reward that all of those people should also recognize as a contributed to. And, we’re very proud of it. We have a phenomenal deposit, and in this business the chances of success are very, very low. We take the view that we’ve got a responsibility to do this incredibly well as a thank you and appreciation recognition of all those guys that have gone before us and who may not have had the technical success that we had, but we have learned off every one of them. Our result is a great result and we still have a lot of work to do before it comes into fruition as a mine that will have a multi-decade life and create incredible positive benefits for a lot of people, not just locally, near the mine or the province of Saskatchewan, but also the country and the world because we’re producing a very clean source of energy. INN: Can you talk a little bit about where you are with the deposit and what the goals are for 2018? LC: Yes. We completed a PEA last year which showed pretty phenomenal economics. We have consequently continued drilling. We’ve been doing the geotechnical work, the metallurgical work all to form the basis of the prefeasibility study which we expect to deliver end of Q3, early Q4 of 2018. And incorporated in that will be an updated resource. As of today, we also announced the appointment of a senior vice president of project development, James Hatley. He comes to us with a wealth of experience in Saskatchewan in operating both uranium mines and mills. We’re very excited about his appointment. It shows a real clear direction of NexGen. We’re only really at stage one of our overall objective. We’re now transitioning and going full-steam ahead towards bringing this remarkable asset into production. INN: Can you talk a little bit about operating in the province of Saskatchewan? The Fraser Institute released a report recently and Saskatchewan ranked fairly highly on the list of top places to be when you’re mining. LC: Yeah, and it is. I’ve gone through permitting mines in Australia, which I’m from, but I now live in Canada and it’s our home, where I think the regulatory framework is very strong. However, Saskatchewan is the number-one province in the world for mining and there’s a really good reason for that — the professionalism of the Saskatchewan government, the regulatory bodies that they manage. They’re incredibly supportive. It’s a real partnership approach and they also see the opportunity for the province of Saskatchewan, working in partnership with us and setting a new elite standard in environmental mine management for a mine of this caliber. Look, governments generally get a bad rep around the world, lot of criticism of governments, but the Saskatchewan government should be applauded. When I started NexGen, we could have gone anywhere around the world. Not only does Saskatchewan and the Athabasca Basin have high-grade, high tonnage deposits, it was also a sovereign factor and their sovereign profile, and the way they support mining. In a real sensible manner, there’s no shortcuts. They’re very, very tough on their regulations and they should be. But they’re ultimately professional and that’s what we go. We made a decision, we’re going to be investing people’s money in a jurisdiction, we can’t be side swiped by political unrest or unfair regulations. That’s why we chose Saskatchewan. INN: Is there anything else you’d like to add? LC: Yeah. Look, it’s a real honor to receive the Bill Dennis award on behalf of NexGen. I thank everyone who’s ever supported myself, the employees, the directors. We’ve got fantastic support in our shareholders, and also our past shareholders who invested early in NexGen when uranium was depressed, they showed really strong commitment. I thank them, I really do. They’ve allowed us to go and achieve this result and as I said earlier, they should feel very much part of this award as we do.